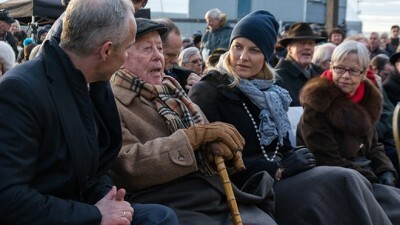 Norwegian government officials were among those mourning the loss over the weekend of Samuel Steinmann, the last survivor of the 532 Norwegian Jews who were shipped to concentration camps aboard a German ship in 1942. A total of 772 were deported during the Nazi German occupation of Norway, and only a few came home again. “As a witness to his times, Samuel Steinmann was important for our entire nation,” Prime Minister Erna Solberg said in a statement issued by the government, which immediately offered to cover the costs of Steinmann’s funeral set for Tuesday. The granting of a state funeral in Norway is one of the highest honors the government can bestow upon a citizen. Steinmann had already been decorated by the king and received many other forms of recognition, for his efforts to educate subsequent generations of young Norwegians about the Holocaust and how Norwegian police complied with the orders of occupying German forces. He was the last of those who could give a first-hand account of what happened to him and hundreds of other Norwegian Jews in the autumn of 1942. He was 19 years old when his family was thrown out of their home in Oslo’s Nordstrand district by Nazi officials after just a two-hour notice, in September 1942. A month later, on October 26, Steinmann was arrested by Norwegian state police along with scores of other Jewish men in Norway. He was held first at Berg Prison in Tønsberg, where he was harassed and beaten by Norwegian members of the Nazi’s paramilitary Hirden organization in Norway. On November he was among the 532 Jewish men, women and children who were loaded onto the ship Donau and sent under terrible conditions on board to Germany. His brother Harry was killed shortly after arrival at the concentration camp Auschwitz, as were many others. Samuel Steinmann himself was tattooed with number 79231 and among the 186 declared fit for work. A year later, only around 20 were still alive. He survived the next two years until Auschwitz was forcibly evacuated in January 1945 after the Soviet Army had crossed into Poland, where the camp was located. Steinmann and five other surviving Norwegian Jewish men were then sent on a death march along with 66,000 others that ended at Buchenwald, where other Norwegian prisoners were also held. They were rescued by the so-called “white buses” sent to bring Scandinavian prisoners home, but the five Norwegian Jews were excluded and rescued only after American forces liberated Buchenwald on April 11, 1945. Steinmann finally made it home to Oslo on May 30, and lived there until his death on May 1st. Steinmann was known as a modest man who didn’t begin to share his horrific experiences at the hands of the Nazis for many years after his return to Norway. Newspaper Aftenposten reported in an obituary on Sunday that Steinmann feared he wouldn’t be believed, and he was also keen to get on with the life he’d finally won back, to raise a family and experience a “normal” life after the trauma he’d undergone. Once he started opening up, however, Norwegians listened and Steinmann realized how important it was to make his experiences known. It took him a long time to finally travel again to Auschwitz, where thousands of Norwegian junior high school students are taken every year as part of their studies of World War II and the Holocaust. But Steinmann also realized it was important to be part of efforts to prevent such horrors from occurring again. Steinmann was not part of the political or cultural elite who earlier have received state funerals. Instead, he represented the importance of history and became part of a nation’s conscience, not least reminding Norwegians how their own dutiful civilian police officers during the Nazi occupation contributed to industrial murder.